The “Distinguished Service Award” is awarded for services and/or leadership rendered to the region’s water community over a period of years. The award recipient(s) can be from any profession or employment, and not necessarily but preferably, from an RWA member agency. This award was established in 2002. Pam Tobin, a member of the San Juan Water District Board of Directors, receives the Distinguished Service Award. Rob Roscoe, General Manager for the Sacramento Suburban Water District received the Distinguished Service Award. Robert Churchill, retired General Manager for the Citrus Heights Water District; and Bill George, former Board President of the El Dorado Irrigation District receive the Distinguished Service Award. Mary Henrici, General Manager of Rio Linda/Elverta Community Water District received the Distinguished Service Award. The Distinguished Service Award was also awarded posthumously to Joe Dion and was accepted by his son Mitch. 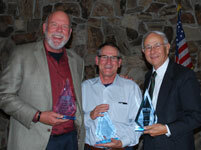 Ed Kriz, Director of Environmental Utilities for the City of Roseville; Dave Brent, former Director of Utilities of the City of Sacramento; and Dave Breninger, General Manager of Placer County Water Agency receive the Distinguished Service Award. Brian Martin, Director of Technical Services for Placer County Water Agency, receives the Distinguished Service Award. Derrick Whitehead, the Director of Environmental Utilities for the City of Roseville, receives the Distinguished Service Award. 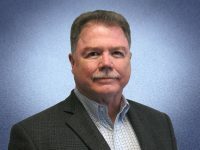 Chuck Rose, a member of the Citrus Heights Water District Board of Directors, receives the Distinguished Service Award. Sanford “Sandy” Kozlen, a member of the Carmichael Water District Board of Directors, receives the Distinguished Service Award. Keith DeVore, director of the Sacramento County Department of Water Resources, receives the Distinguished Service Award. John Fraser, a member of the El Dorado Irrigation District Board of Directors, receives the Distinguished Service Award. 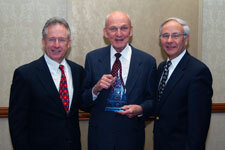 Ed Tiedemann, senior attorney with Kronick, Moskovitz, Tiedemann & Girard, receives the Distinguished Service Award. Ane Deister, general manager with El Dorado Irrigation District, receives the Distinguished Service Award. 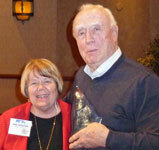 Byron Buck, former director with Sacramento Suburban Water District, receives the Distinguished Service Award. 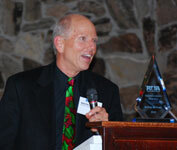 Leo Winternitz, former executive director of the Sacramento Water Forum receives the Distinguished Service Award. Frederick Tomich, (pictured) director with Orange Vale Water Company and David Spath, retired director of the California Department of Health Services receive the Distinguished Service Award for 2005. Joseph Alessandri (pictured) and Walter Pettit each receive the Distinguished Service Award for 2004. Jim English, retiring general manager of San Juan Water District (left) receives the Distinguished Service Award from Bob Churchill, general manager, Citrus Heights Water District. LaNell Little, retired general manager of Carmichael Water District (right) receives the Distinguished Service Award from Paul Selsky, board member, Carmichael Water District. Lyle Hoag, retiring director of San Juan Water District (left) receives the Distinguished Service Award from Rich Plecker, general manager, Fair Oaks Water District. FOWD General Manager Rich Plecker.